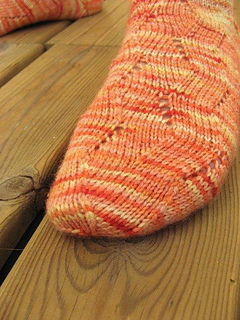 This pattern first appeared in April 2013 in the Suuri Suomalainen neulekerho yarn club for the yarn store Villavyyhti. From July 2013 the English version has been available for purchase in my Ravelry store. As of February 2014 a Finnish version of the pdf has been added as an alternative for the English translation of the pattern. When you download your pattern purchase, the pdf name clearly states the language of each file. “keinahdus” could be translated as “a small swaying motion”. 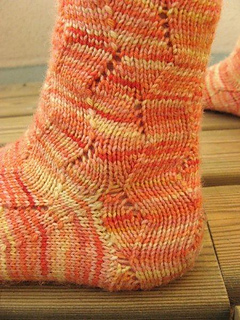 is well suited both for solid and variegated sock yarns.